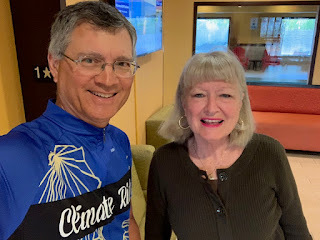 A journal of Tim's bicycle odyssey as he crosses the continent from San Francisco to Boston on his bicycle to talk with people about Oceans, Plastic, Climate Change, and Kids. Some posts may not be in exact sequential order. Please also see ZeroW.org. Thanks! Much warmer today -- 60s and 70s. I started the morning a great chat with Kathy and Judy who are part of a church group from Nevada visiting Harrison. 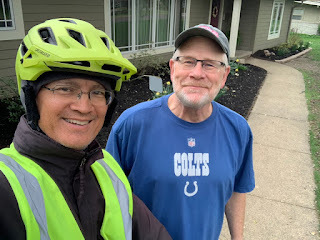 When I got on the road I was happy to ride a wide shoulder as well as see a sign reminding motorists to share the road -- bicycles are vehicles that can use the road too. I passed by Harrison High School on the way out of town. Happily the roads were pretty empty. And I was able to ride some country roads. With sweeping vistas of the surrounding land (after a bit of climbing of course). Went by the Dew Drop Inn. Also passed a soccer complex with about a dozen soccer fields. Just a few pictured here. A bit of eroding bank is endangering this road. But the scenery is relaxing. Today started quite chilly in the 30s and cloudy. Shoulder a bit narrow after leaving town but rideable. Very glad the shoulder got very wide about 9 miles out. Here is a Gatorade bottle I picked up. Lots of plastic trash on the road. Although the highway had a great shoulder, I was happy to leave it to ride on this country road with almost no traffic. Spring is sprung in this area with lots of flowering trees. Some houses have super large lawns the size of soccer fields or bigger. Lots of farming in this area.